Seven strangers awake to find themselves in rooms of Cube: 14'x14' metal boxes with an exit in the center of each wall and ceiling. Some rooms are trapped with lethal sci-fi devices. None of the doors seem to lead anywhere but to other rooms. It's like something out of a computer RPG. 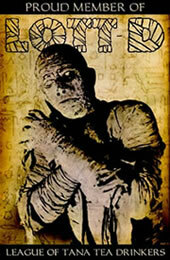 They join together to try to find their way out, and slowly start to unravel the mystery of Cube. There are just seven actors, and four principals, but they are all solid and engaging: Quentin (Maurice Dean Wint), the tough cop who slowly disintegrates, Leaven, a nerdy school girl played with wit and intelligence by Nicole de Boer ("Star Trek: Deep Space Nine" and "The Dead Zone" TV show), Holloway (Nicky Guadagini, Crash), a liberal-paranoid doctor who is delighted to find her conspiracy theories confirmed, and Worth (David Hewlett), as cynical office worker used to being a cog in some unfathomable machine. Questions of politics, philosophy, and societal standing are on touched on in the dialogues of the characters. Samuel Beckett and Franz Kafka are never far out of mind. But what really interests the director is the question: how many ways can one film a cube and still keep it engaging? The answer: more ways than you think. He uses every shot one can imagine to get the most of his limited set: colored lighting, expressionist camera angles, odd close-ups, shots from one cube into the next. The last shot is remarkable: a simple FX shot that serves as both a fitting conclusion and a spiritual metaphor. It is easy to read allegory into Cube. One character refers to it as a public works project gone unchecked and unmanaged. But the audience can just as easily read Cube as an allegory of life: we don't know the reason or purpose, we are stuck here with strangers, and we have to find a way to make the best of it and cooperate if we want to survive. Viewed this way, the ending is both nihilistic and sublime. 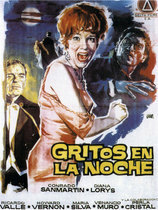 The film contains effective, low-budget photography, solid performances, and a good score. 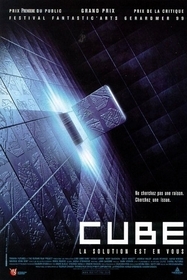 But what really sets Cube apart from so much sci-fi drivel is that the director never forgets that while he can be as philosophical, and intellectual, and clever as he wants, the most important thing is to be entertaining. If there are any lessons to be learned from Cube, they are for film students and low-budget directors. It won't tell you how to live a useful life in an uncaring, arbitrary universe. But will show you how to take a worn premise, a small cast, and a single set, and make a terrific little film.